Two beautiful Grosbeaks share a tree on an early Spring day. If you notice, there is no snow. We've been getting so much of it here, I decided it would be nice to get away from it for a bit and paint an early Spring scene. Though these birds occasionally show up at feeders in the winter months here, normally we see them in the warmer weather. I've matted this original watercolor painting in a 5"x7" mat and protected it with a crystal clear sleeve so it's ready to display as is or in a 5"x7" frame. 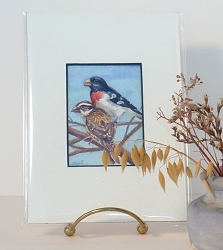 You can see larger pictures and purchase Rose-breasted Grosbeaks in my Etsy shop, JanetZeh.Etsy.com. 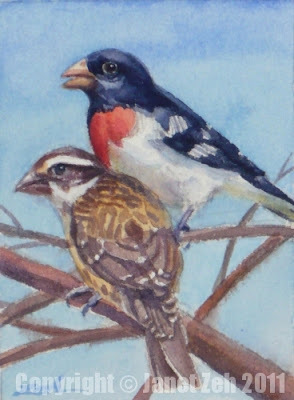 Do you see Rose-breasted Grosbeaks where you are? Alas, out in California, we are grosbeakless. The closest thing we have around here are house finches and various kinds of sparrows, ranging from house all the way through white-crowned. Too bad about that, Kessie. Sparrows can be pretty too, though. See if they are the same birds as yours.